JOHANNESBURG, Aug 27 (IPS) - Access to safe water for drinking and an adequate supply of water for other purposes is challenging in the rural areas of Vanuatu. A new project, that uses solar water pumping technology, will save time and energy for rural women whose task it is to collect and make water more accessible to their communities. Just over half the population in Vanuatu had access to appropriate facilities for basic sanitation in 2015, but with an annual progress of 0.2 percent, the country is projected to achieve basic sanitation targets far in the future. For Vanuatu, the rate of progress on water is slow. The Vanuatu Government is working with ministries and institutions to mobile finance and implement projects to ensure that communities in the country have access to clean and safe drinking water. A recent partnership to provide solar-powered water pumps to 30 communities in rural areas and on remote islands will address the lack of secure freshwater access, which also results from extreme climatic events such as drought, which frequently hit Vanuatu. "This in turn should improve rural livelihoods also improve sanitation and health for the project beneficiaries," says Paul Kaun, Global Green Growth Institute's (GGGI) senior project officer for Vanuatu. It will also cut CO2 emissions and improve "opportunities for income generation in rural areas through more reliable and safe water supplies." In July, the government of Luxembourg signed an agreement with GGGI committing about USD 1,750,000 to the provision and installation of the solar-powered pumps on Vanuatu. GGGI, an international organisation that works with developing and emerging countries to create programmes according to a sustainable green growth model, will administer the funds through the agreement. The project will be implemented in close partnership with the Vanuatu ministry of climate change, the department of energy and department of water. "Vanuatu is one of the small island states in the Pacific region that faces climate change because they are very vulnerable. But given that, there is a lot of potential for sustainable development," says Dr. André Weidenhaupt, director-general at the department for environment in Luxembourg's ministry for sustainable development and infrastructure. Considered the world's most vulnerable small developing nation to climate change and natural disasters, Vanuatu, which is located just east off Australia's Queensland coast, is regularly affected by droughts, cyclones and volcanic eruptions. In recent years it has experienced rising sea levels, increased frequency and intensity of cyclones, and drastic changes in weather patterns that affect agricultural production. Vanuatu ranks 134 out of 188 countries o the United Nations Development Programme's Human Development Index. The project goals address crucial areas of development on the island archipelago as some 43 percent of Ni-Vanuatu are categorised as living in poverty and the nation remains heavily reliant on fossil fuels. According to the GGGI Vanuatu Country Planning Framework (CPF) 2017-2021, a strategic planning document which commits GGGI and the Government of Vanuatu to common goals for green growth, "rural electrification rates are very low—under 10 percent of households." The large majority, 76 percent, "are located in rural areas, where only one in 10 homes, under half of the schools (42 percent), and one in four health facilities have some self-generated electricity (mainly petroleum fuel based)." "A challenge is to make energy accessible to all, but by means that are climate safe. This can be with small scale photovoltaic systems, which are assessable to everyone, and which is feasible," Weidenhaupt says. "The goals are at first level to provide clean and safe drinking water and, in parallel, to give access to sustainable energy for all at local and regional level. And at secondary level this allows economic rural development in Vanuatu," Weidenhaupt adds. In 2015, the category 5 Cyclone Pam—the strongest on record in the region at the time—affected 74 percent of the islands' 300,000 people. It cost the nation more than half—USD450 million—of its national gross domestic product, says Kaun. In the aftermath of Cyclone Pam, access to clean water was a major challenge as "68 percent of rainwater harvesting structures were damaged and 70 percent of the existing wells and water systems were contaminated," Kaun tells IPS via email. The Vanuatu islands sit 90 centimetres above sea level. But according to a U.N. Children's Fund report, the sea level has been rising by 5.6 millimetres per year since 1993, and is expected to reach more than 50 centimetres by 2100. As sea levels rise, and people migrate to the islands' interiors, water quality is under threat. According to the CFP, "access to reliable safe water supplies in rural areas is low." The many islands that make up Vanuatu are too small to have significant natural lakes or artificial reservoirs, and "river courses are short and the flows are short lived especially in dry periods," according to the Food and Agricultural Organization of the U.N.
"The migration of people into the islands' interiors also threatens the quality of surface water supplying downstream coastal villages. The water supply is either taken from groundwater via open wells and bores, from surface water sources, or rainwater collection with storage in ferro-cement or polyethylene tanks," Kaun says. The country's economy depends largely on tourism and agriculture. A government report, funded by the U.N. Framework Convention on Climate Change for the Least Developed Countries, noted "small-scale agriculture provides for over 65 percent of the population while fishing, offshore financial services and tourism also contribute to the government revenues." It is one of the reasons why the Luxembourg government/GGGI/government of Vanuatu partnership is key to assist the people of Vanuatu. 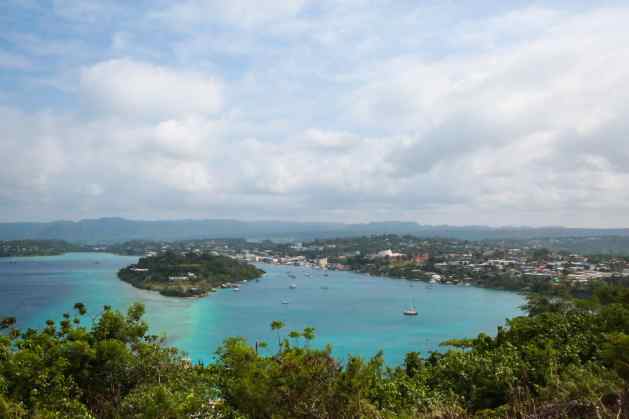 "Vanuatu has a relatively smaller revenue base. Tourism has been the main contributor of national GDP and also contributes to government revenues, most of which are on government operations. Therefore, Vanuatu relies a lot on external aid for development and building climate resilience," says Kaun. Weidenhaupt points out that "this nexus between water supply and renewable energy is a very important one." He says both technologies can be conceived in a decentralised way that has advantages in places like Vanuatu. "You can install them in a couple of households, in small municipalities even in larger municipalities. They are like building blocks and can be conceived in whatever dimension," Weidenhaupt says. Weidenhaupt notes that GGGI is an ideal partner as the organisation has a wide range of experience and scope in projects that are at the nexus of climate change, sustainable development water management and other environmental objectives. "In relation to climate action, Luxembourg immediately realised we needed an additional geographic focus, and that's the small pacific island states. We looked to find a partner for that, and obviously GGGI is very active in this area," Weidenhaupt says. Vanuatu became a member of GGGI in 2015 and since then GGGI has been working with the government of Vanuatu to promote green growth and assist in meeting Vanuatu's national development objectives. For the Luxembourg government-funded solar water-pumping project, GGGI has formed a partnership with both the department of energy and the department of water, to implement the project. "We have also regularly involved other key government agencies such as the ministry of finance and the prime minister's office in training workshops at both national and regional level and country meetings. These national agencies are consistently involved in GGGI's in-country activities and programmes," Kaun says. GGGI has assisted in reviewing and updating the National Energy Road Map (NERM) in 2016. "One of the objectives of NERM is to achieve the NDC target of 100 percent renewable energy (RE) by 2030, aimed at reducing the national CO2 emissions. Another objective on the NERM is to use renewable energy for green growth, including in the water sector," says Kaun. Nationally determined contributions or NDCs are blueprints or outlines by countries on how they plan to cut greenhouse gas emissions. The government of Vanuatu also aims to achieve 100 percent rural electrification by 2030. Kaun adds that GGGI's open and transparent processes played a key role in gaining the confidence and trust of the Vanuatu government. Meanwhile, Weidenhaupt envisions the potential for a sustainable economy on Vanuatu. "There is the whole ensemble of sustainable aqua culture, which can be developed in these island states. There is the whole potential of sustainable tourism which can provide for development staying in the limits of our planet," he says. Weidenhaupt notes that in order to benefit from Vanuatu's resources there is a need to better coordinate management of energy, water and marine sectors and to integrate environmental management with economic development. But finally, Vanuatu has the potential for rural development, which, Weidenhaupt says, "is very key to sustainable development and which is perfectly adapted to smaller areas like Vanuatu or Luxembourg - to give this as a comparative example."